The Wheel of Life and Death is a central concept and image in Buddhist understanding. Escaping the Wheel of Life and Death is a Buddhist aspiration. Being unable to escape the Wheel of Life and Death would be a condition of spiritual torment. Yet, this is where the protagonists of many Japanese Noh plays find themselves: as ghosts unable to escape the Wheel of Life and Death. character Unai in Motomezuka, Act 2, mask carver unknown. Japanese Noh Theater is magnificent and rarefied—a living Buddhist performance art more than 700 years old with roots and formal elements much older. In the 14th century, the performer-playwright and head of a performing clan family Kan’ami Kiyotsugu (1333–84) wrote the play Motomezuka (“The Sought-for Grave”), which tells the plight of a maiden who committed suicide after two young men killed each other when fighting over her. 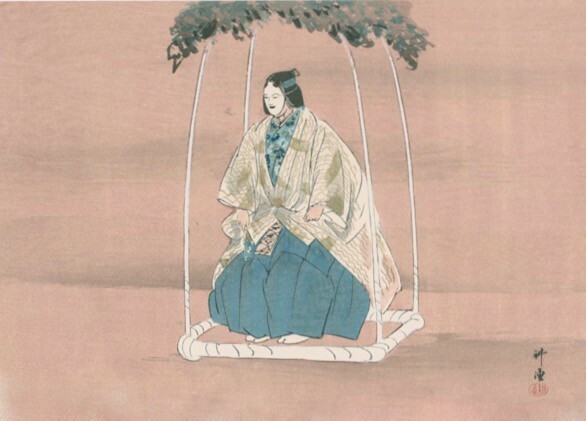 Kan’ami’s son, Zeami Motokiyo (c. 1363–c. 1443), further refined both the artistic and spiritual qualities of the play—the Beauty and the Sadness. 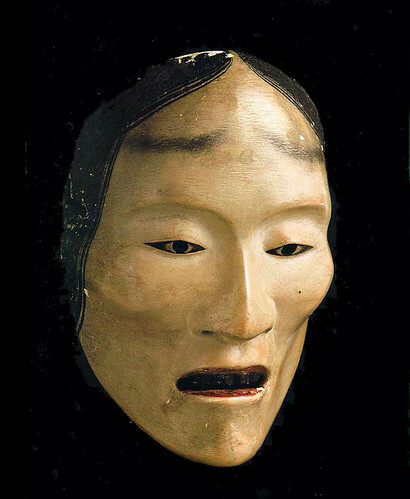 Aesthetic moments in Noh plays—such as those produced by a subtle manipulation of the mask—are Zen moments revealing “the suchness of things,” but the story is couched in Mahayana terms of redemption and progress on, or escape from the Wheel of Life and Death, to a better rebirth or to enlightenment. The poetry of the art form relies on the misdeeds and spiritual mishaps of the main characters, who are often great figures from pre-Buddhist Japanese history, now made over into stories of their afterlives. Unai revealed as a tormented ghost (Motomezuka, Act 2), by Tsukioka Kogyo (1869–1927). Noh is art, not religion. It speaks with the combined languages of dance, song, chant, music, poetry, and drama. Ghosts return to re-live the love, or battle, or karmic experience binding them to traverse the hells in restless spiritual anguish. They pretend to be real people, but often a wandering priest will discover their ghostly identity and can therefore pray and release them from the Wheel of Life and Death. Not so for Unai, the maiden in Motomezuka. On one level, Noh plays are morality plays. They are exercises in artistic Zen. 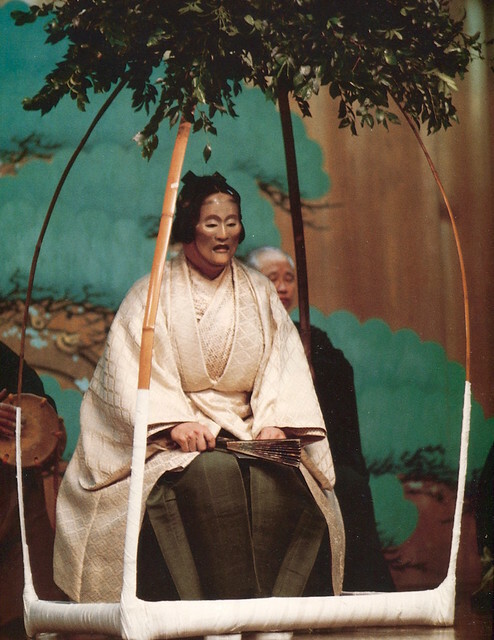 A variety of spiritual states are the content for artistic choices in Noh, using the Wheel of Life and Death as a canvas and palette for tragedy, love, ecstasy, and the journey through different realms. 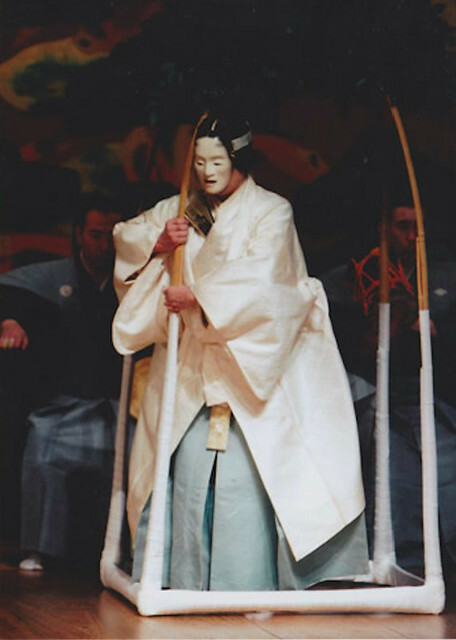 Noh plays are seasonal, and meant to be performed at specific times of year. Motomezuka is a play to be performed in late winter/early spring: an analogy for a winter that never ends. Please enjoy the following excerpts from a performance adaptation of Donald Keene’s translation of Motomezuka (Keene 1970, 42–44). 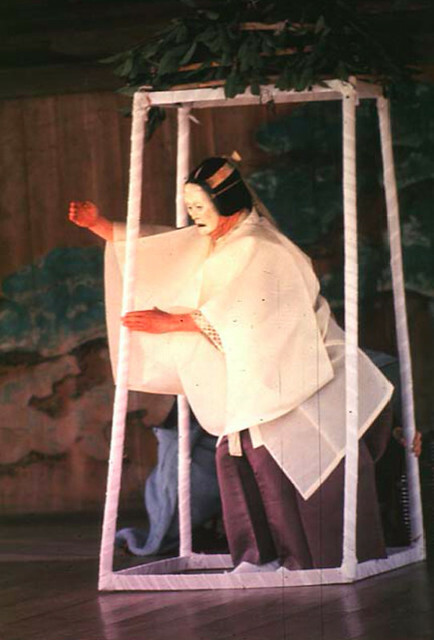 Noh plays embody the truth of the evanescence of life and being. The energy of the actor pours through the mask and costumes. The scene here, which occurs in Act 1, is the maiden Unai’s response to the traveling priest when he asks her what she is doing. In the second half of the play, to follow, Unai reveals that she is a ghost unable to escape the Nine Hells. Motomezuka, Act 2, performed by a troupe of the Kita School, April 1977. Such foolishness, foolishness, all these questions! So little time remains for you too, oh traveler. Pull up the blue-green plant. A bridge that joins lover and beloved. It feels like the old year still. Bow with the burden of the snow. And where is the Spring, we wonder? Keene, Donald. 1970. 20 Plays of the Noh Theater. New York: Columbia University Press.